Wealthy businessman, Will Frost, gets woken in the middle of the night by an anonymous caller, asking him exactly this. In the first of these strange houses, a gruesome murder has already taken place. Will is then told that his own family is in mortal danger. Richard Parker has been a professional TV writer for twenty-two years and started by submitting material to the BBC. After contributing to a wide variety of TV shows he became a head writer, script editor then producer. His first novel, Stop Me, was shortlisted for the prestigious UK Crime Writers Association John Creasey Dagger Award. He has had two short movies shot "Estranged" and "Sleep Tight" (hitting festivals near you in 2012). More importantly, he has just finished penning a brand new thriller for publication. He has now moved from London to Salisbury but in no way hates London. He divides his time between reading, writing, cooking and visiting old English pubs. He is currently working on his third novel." 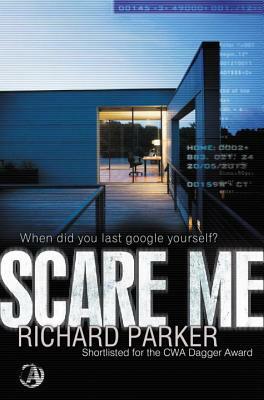 "SCARE ME is an engrossing, addictive, and all consuming thriller by an author who looks to have mastered the craft of suspense and heart pounding action. I highly recommend SCARE ME." "A roller coaster ride of thrills. The tension never lets up – do NOT read this at night because you will not go to sleep until the book is finished." "The storyline for Scare Me is so well thought out and written. The believable characters facing such heinous but not impossible situations makes for chilling reading." "The human connection family—constructed or biological—provides a sharp contrast with the technological connections that bind the characters, test the characters, and threaten to break the characters if the inevitable linkage failures occur." "Lock your doors, keep the lights on and plan to stay up late, because this is one very clever scavenger hunt from hell that you won’t want to miss!" "Creepy, menacing, tramatic, and full of supense and tension, this book is definitely a keeper. I easily read over half of it in one go and definitely recommend it to fellow thriller readers." "Full of tantaslising twists and turns, this novel keeps you guessing until the very last few pages and then teases you with the potential for more. An utterly fabulous crime novel that will keep you pinned to your seat."